I took advantage of two deals/sales. One of The advertised deals stated that when customers buy one select Gillette razor, they would receive $5 in CVS Extrabucks. The other advertised deal stated that when customers spend $15 on select Pantene products, they would receive $5 in CVS Extrabucks. 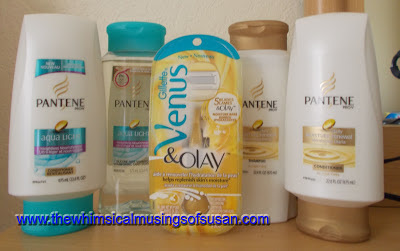 I decided to buy 4 bottles of Pantene Pro V products and 1 Venus & Olay Razor by Gillette. The total came to $35.25, plus sales tax. I had 3 manufacturer coupons, which came from Sunday paper inserts, for Pantene and Gillette products and 2 CVS Extrabucks, so I applied them towards the total. Even though the sale price of the Pantene shampoos and conditioners was $5.99 each, I got $6.99 off by using the BOGO manufacturer coupons. The cashier scanned the BOGO manufacturer coupons and that is the amount that came off of the total. I paid $8.60 out of pocket and received $10.00 in CVS Extrabucks in this transaction. So, it’s like I got all of this for free, plus a profit of $1.40. What a sweet deal!